All base elements must be stored in the system. Derived elements, such as the employee year-to-date gross pay, may also be stored in the system. Data stores are created for each different data entity being stored. That is, when data flow base elements are grouped together to form a structural record, a data store is created for each unique structural record. Because a given data flow may only show part of the collective data that a structural record contains, you may have to examine many different data flow structures to arrive at a complete data store description. 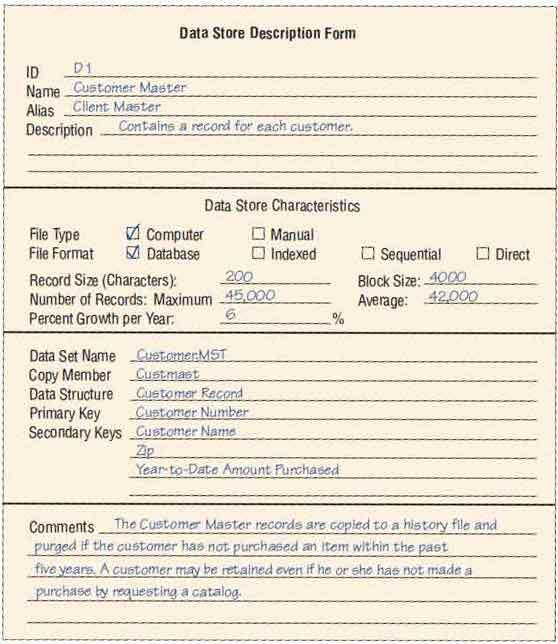 Figure illustrated below is a typical form used to describe a data store. 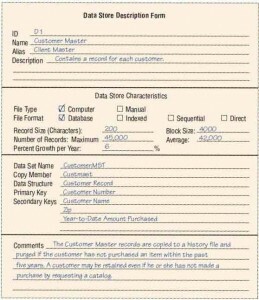 An example of a data store form description for World’s Trend Catalog Division. The data store ID. The ID is often a mandatory entry to prevent the analyst from storing redundant information. An example would be D1 for the CUSTOMER MASTER. The data store name, which is descriptive and unique. 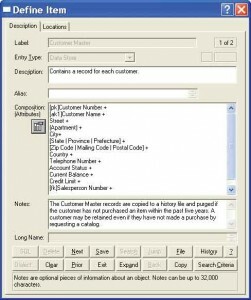 An alias for the table, such as CLIENT MASTER for the CUSTOMER MASTER. A short description of the data store. The file type, either computer or manual. The maximum and average number of records on the file as well as the growth per year. This information helps the analyst to predict the amount of disk space required for the application and is necessary for hardware acquisition planning. Visible Analyst screen showing a data store description. The data structure should use a name found in the data dictionary, providing a link to the elements for this data store. 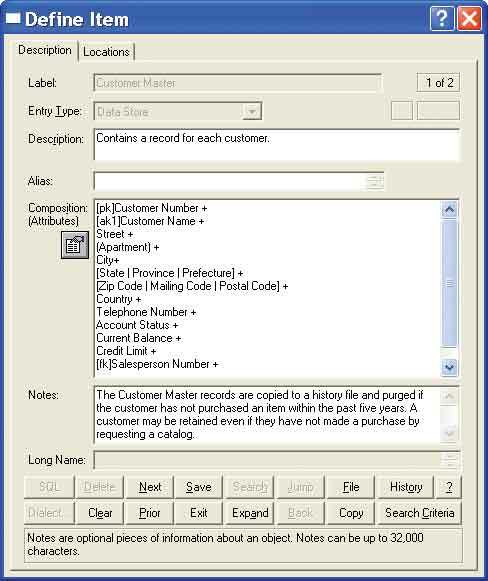 Alternatively, the data elements could be described on the data store description form or on the CASE tool screen for the data store. Primary and secondary keys must be elements (or a combination of elements) found in the data structure. In the example, the CUSTOMER NUMBER is the primary key and should be unique. The CUSTOMER NAME, ZIP, and YEAR-TO-DATE AMOUNT PURCHASED are secondary keys used to control record sequencing on reports and to locate records directly. (Keys are discussed in Chapter 13.) Comments are used for information that does not fit into any of the above categories. They may include update or backup timing, security, or other considerations.